The Parable of the Good Samaritan has become commonplace in our language and story. We often talk of the Good Samaritan who helped the needy, returned a lost item, or took someone under their wing. In policing, the term Good Samaritan is often applied to an individual who steps in to assist police, attempts to stop a crime from happening, comes to the aid of a victim, or in the case of one of our clients, Bill Evanow, someone who tries to stop a person from entering their property in an attempt to flee from police. On March 12, 2011 Bill’s life, and the lives of his family members, would be dramatically altered. Earlier that evening a young man and woman stole a truck and proceeded to take it on a ride through streets, suburbs, and spike belts, eventually bringing it to a stop at the foot of the driveway of Bill’s Maple Ridge home. The two exited the vehicle, and came onto Bill’s property. With no sign of police nearby other than the background noise of “Air One”, the RCMP helicopter overhead, Bill watched the man run up towards his house. Grabbing the first thing he could find, a snow shovel, he confronted the man and ushered him away from the house and his family. Bill successfully moved the suspect away from the house, and toward the laneway. He tried to stop him by tripping him, but ultimately gave up the chase and turned to return home. Before he knew it, a police dog was on his leg, biting and tearing. The police report says the officer yelled out for both Bill and the suspect to stop, and that Bill complied while the suspect fled, but Bill says things went very differently. 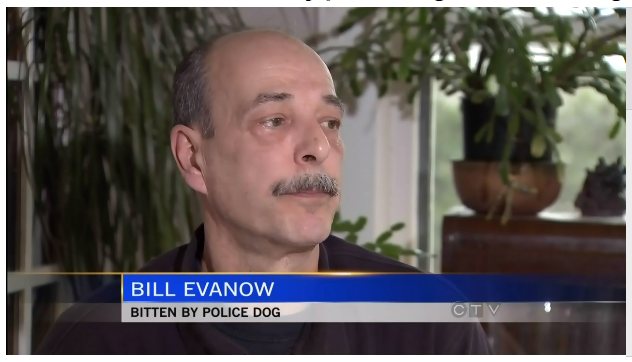 Not only did Bill never hear from or see any RCMP officer until after the dog was on him, he was not even aware the dog biting him was a police dog until it was too late. Then, to add insult to injury, when officers found Bill, they stepped on his hands to get him to stop moving, still unaware that they had the wrong man. In a two part series, which aired on CTV news this week, investigative reporter Jonathan Woodward examined Bill’s case and asked how it could have been prevented. Part 1 of the story, which features Bill’s story, can be seen here. Part 2 of the story, which analyzes the training and deployment of police dogs, can be seen here. In the end I’m not sure the parable of the Good Samaritan applies so well to policing. In the original story from the Bible, the Samaritan stops to take pity on a man who in the ordinary course of things would be his mortal enemy, stepping in when others turned away. Bill did not hate police and he stood neither above nor below them, he simply reacted to a situation in the same way so many of us would. We are constantly looking for differences when we hear stories like this. It is easy for us to react and say that Bill ‘got in the way’ of the police, or that he did something wrong. The harder truth is that because of the current way we train and deploy police dogs this could happen to any of us. In the coming year we’ll be revealing more stories of people, guilty and innocent, Good Samaritan and bystander, who have been bitten by police dogs with horrible consequences. Some are people who made bad decisions; others are people who were simply in the wrong place at the wrong time. Our goal is that by the close of 2013, we will have achieved meaningful dialogue and reform on an area of policing that currently accounts for over half of all police related injuries. After years of silence and inadequate reporting we now know that every two days in British Columbia someone is injured by a police dog, with the VPD reporting ten times more bites per capita than New Westminster and Saanich, who employ the bark and hold method of training. We believe these lopsided statistics, along with stories like Bill Evanow’s, will finally force the provincial government to step in and put a stop to the unacceptable number of police dog injuries in our province.